The Joint Secretary and Spokesperson for the Ministry of Foreign Affairs of Nepal, Mr. Bharat Raj Paudyal, visited UNRCPD’s office in Kathmandu on 12 June 2018. Mr. Paudyal met with UNRCPD staff to discuss disarmament and arms control in Nepal, and was provided with detailed explanations of ongoing and future projects, with particular focus on the reduction of gun violence from gender perspective, supporting the implementation of UNSCR 1540 (2004), technical and legal assistance to control SALW, and training on the International Ammunition Technical Guidance (IATG). 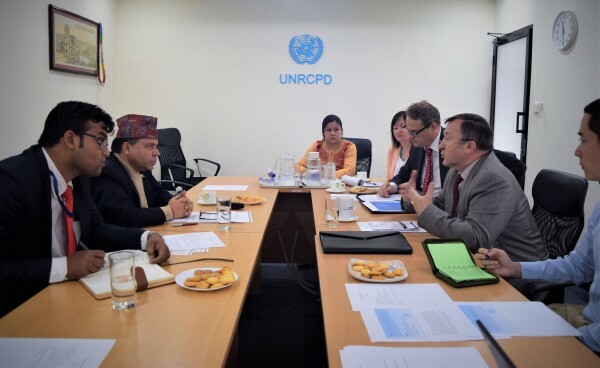 Pictured below, Mr. Bharat Raj Paudyal and Mr. Yuriy Kryvonos, Director of UNRCPD, discuss about best means for implementing these and other projects in Nepal.